This is the first in my occasional series of “Books on the Horizon” – travelogues I dream of researching and writing, though probably never will. My “Books on the Horizon” are an exercise in creativity, idle whimsy and – through any reactions I get – testing the water. 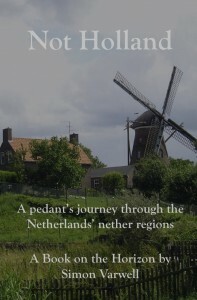 Not Holland: A pedant’s journey through the Netherlands’ nether regions. What I love about this book is that the title does what it says on the tin. This would be a trip throughout the Netherlands, without ever setting foot in Holland. I’d explore the lesser-known provinces and try to find out if the Dutch people even remotely care about the important distinction between Holland and the Netherlands. If you follow me on Twitter, you may from time to time have seen me troll the official Dutch tourism account, @VisitHolland, in response to their occasional tweets about destinations that aren’t actually in Holland. One of my pedantic bugbears is people calling the Netherlands “Holland” – when the two terms are not the same. Holland consists of two provinces, North Holland and South Holland, and the Netherlands as a whole contains ten other provinces in addition. The Hollands together include many of the Netherlands’ biggest and most famous places, yet don’t even have half the Dutch population between them and are less than a sixth of the territory of the Netherlands. To see people use “Holland” when they mean “the Netherlands” winds me up almost as much as people confusing England, Britain and the UK, or the now historical example of interchanging Russia and the Soviet Union. It’s not even as if the Dutch are the victims here: they regularly use “Holland” for their national football team, and of course there’s the tourism authority I mentioned above. Internationally, ‘Holland’ is often used to indicate the Netherlands. Yes. Wrongly. Frequency of use has no bearing on something being correct. Holland is also the brand that is used to promote business and leisure trips to the Netherlands. By who? People who are wrong! What sort of cretins promote their country using a wrong name? I wouldn’t want to invest in a country that didn’t even know what it was called. We have chosen Holland as brand name because Holland is internationally well-known, popular and an accessible name for our country. But also a bloody incorrect one! And it’s probably only internationally well-known because you’ve propagated the error or, at the very least, done nothing to deter it. Furthermore Holland stands for all our country’s positive elements, the elements that attract foreign leisure and business travellers. You what? You’re saying that the other ten provinces don’t stand for the best of your country? That’s insulting and frankly a little racist. Holland also sounds more hospitable than the rather official ‘the Netherlands’. No it doesn’t. “Welcome to the Netherlands, have a lovely stay” sounds more hospitable than the rather official “You are now entering the Netherlands. Please observe all laws within this jurisdiction”. Hospitality depends on attitude, not words. Anyway. To step off my pedestal for a moment, I have three motivations for this book. Firstly, I want to know if this misuse of “Holland” is a unanimous approach. Do all Dutch people accept this error? And, importantly, what do people in the provinces outside Holland think about being referred to as Holland when they’re clearly not? Nearly all Scots would be most aggrieved at being called English, and I imagine the same for Catalans being called Castillians, or Westphalians being called Bavarians. Do the good folk of, say, Friesland or Utrecht feel the same sense of insult? Secondly, in a world where it’s apparently all about “Holland”, is it not time that the other provinces got a look in? Provinces that gave us Frisian cows, Philips electronics and the Maastricht Treaty need to be recognised and celebrated for who and what they are. A book all about them could be a distinct and refreshing counterbalance to the extensive coverage received by places in Holland like Amsterdam, Rotterdam or The Hague. Thirdly and finally, the Netherlands is a brilliant country. Yes they don’t seem to know their own name, but the Dutch are a conistently warm-hearted, intelligent, engaging people I have never failed to enjoy meeting. The country is renowned for being open, tolerant and welcoming, with a long, rich history and many beautiful towns and cities. I visited the Netherlands once (mainly Holland, I confess) in 2004 and found it a cracking place to visit – great infrastructure, easily navigable, and architecturally fascinating. I’d happily go back, especially to some of these lesser known parts. This book really appeals to me because of its entirely whimsical and silly premise, but also because it involves a country that would be genuinely and seriously interesting to explore. Thankfully the very basic objectives won’t require too much research or knowledge, in that all I will need is my eyes and ears. And given the Dutch are gifted English speakers, I wouldn’t even need to learn much Dutch. Though out of politeness and curiosity I’d certainly try to acquire a bit. All this means, however, that this book could quite easily be done by anyone. That simplicity and accessibility is, I think, part of the concept’s strength. I do hope nobody beats me to it. Being proved right that the distinction between the Netherlands and Holland matters to people. And really getting to know and like the Netherlands, and discovering some quirky and interesting stories from its lesser-known corners. Being proved wrong that the distinction between the Netherlands and Holland matters to people. And having a slightly dull and predictable time in a country that is far from a mystery, and is, after all, one of the easiest and safest countries in the world to travel around. Another strength of this book is that it doesn’t present too much of a resource problem. I imagine you could get around the ten non-Holland provinces without rushing unduly in a month, though ideally two. That would suggest a budget of a grand or two to be on the safe side. This book – like all the books in this series – is unlikely. But it’s probably among the most realistic of all my Books on the Horizon. It’s a simple concept, would not require enormous amounts of research, and the prospect of rustling up a month and a thousand pounds would be hard but not impossible.